The exterior of a designer’s home has a ‘barnyard look,’ while the interior mixes quartz, wood, steel and granite. Photos by Capulion Creative. Comfortable chairs covered in a bright blue fabric with an Ikat design add a colorful design note in the sun room. 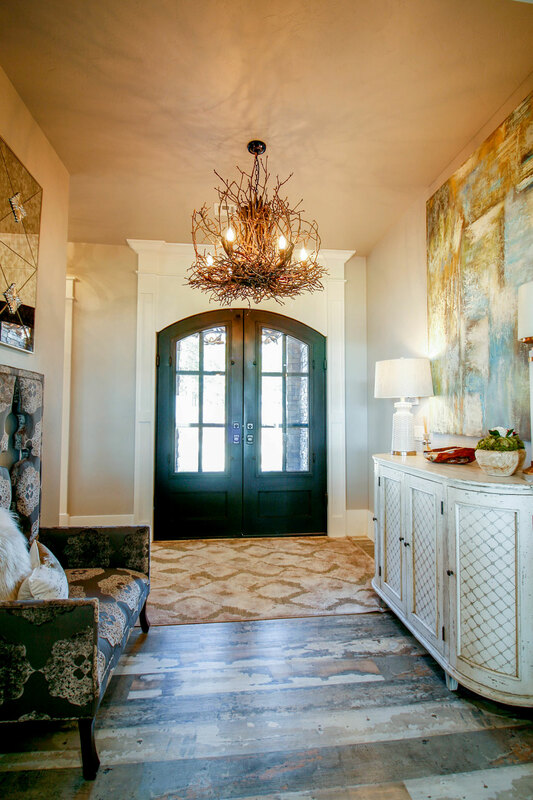 The front entry to the Bensons’ home is highlighted with an impressive twig chandelier. 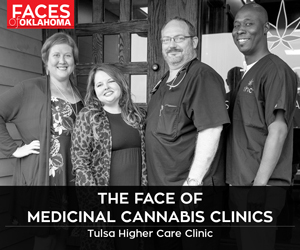 “I live in a glass house that’s very functional and comfortable, with a simple floor plan, hardly any walls, mostly windows and a great view of Grand Lake,” Amber Benson says. Amber knew exactly how to achieve that. She’s been in the interior design business for 23 years and opened her own design studio, Nuance Interiors, in 2016. 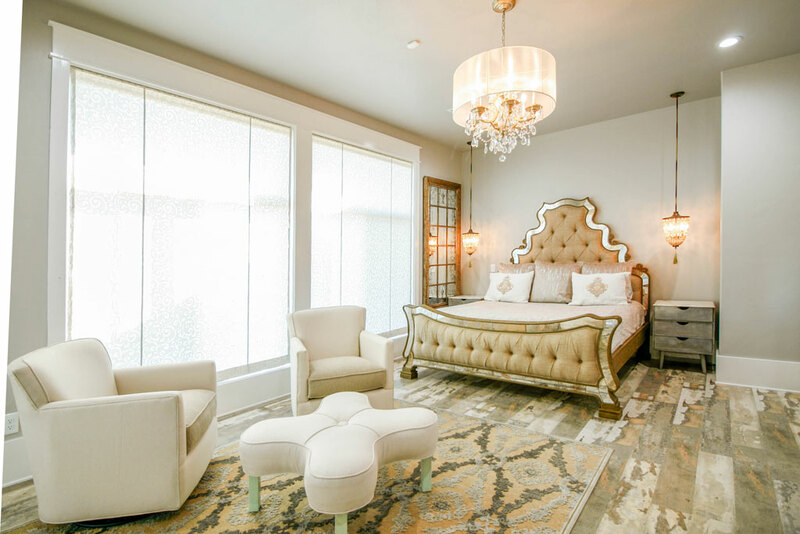 Amber credits long-time clients with making the almost impossible happen by pitching in to get Nuance Interiors and its turn-key approach to design opened quickly. 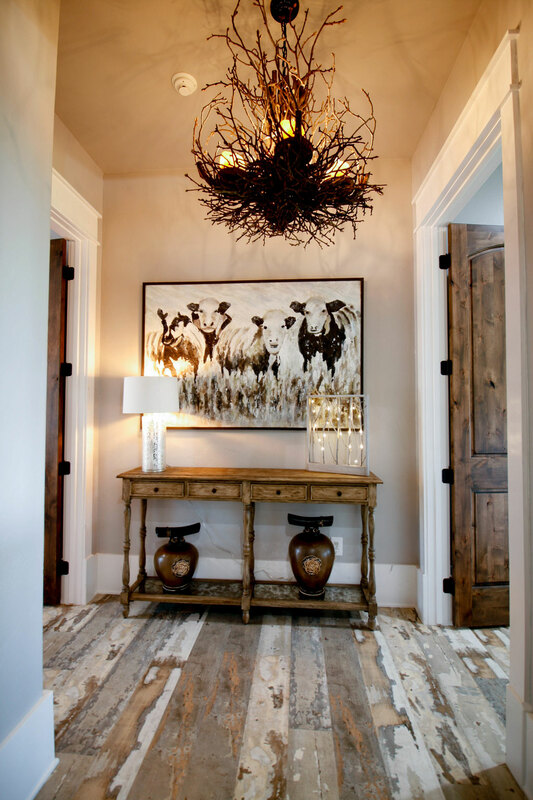 The decor in her home is simple and clean, and features modern surfaces mixed with unique touches, such as twig-shaped hardware in the kitchen, chandeliers made from bent twigs and art pieces created from distressed wood. The family’s kitchen is bright and airy. 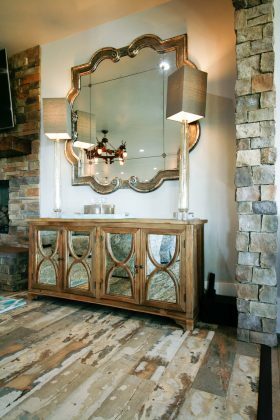 A handsome pine credenza in the living area features an unusual mirror and twin table lamps with mirror accents. 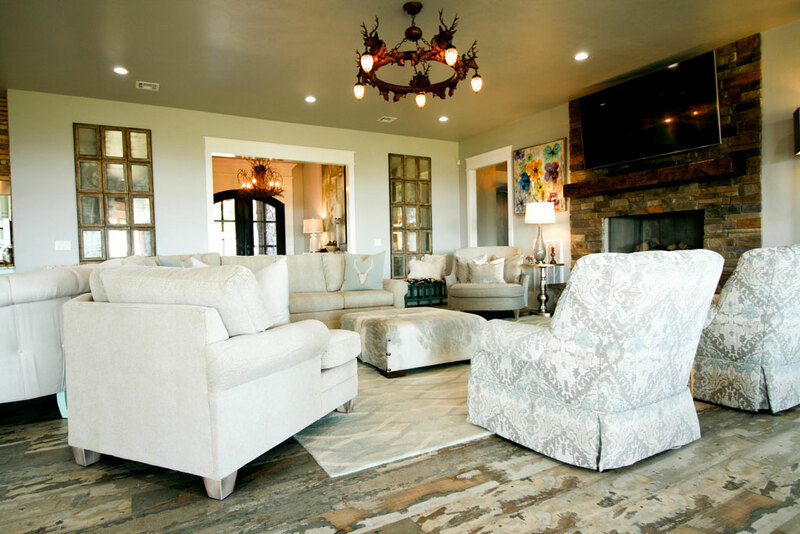 Ample seating in the living/family room makes this a favorite gathering place for friends and family. She reached out to Tammy Trotter with Silex Interiors for assistance with material selections for the kitchen and bath. 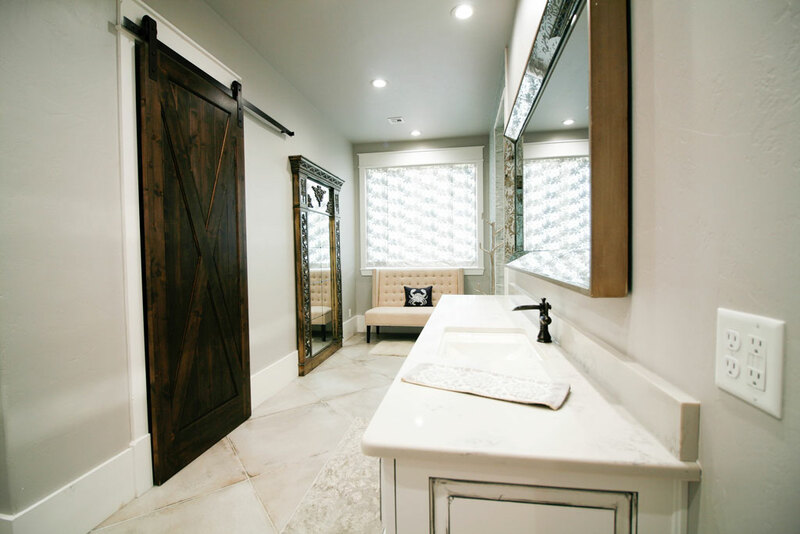 Quartz was Tammy and Amber’s choice for the hard surfaces, including the master bath, which features vanity countertops coordinated with the look of the shower. “Quartz is a man-made product that is scratch and stain resistant and similar in price to marble,” Tammy says. Tammy also assisted with the kitchen countertops and backsplash, which are Mount Everest-white granite over mint-green cabinets. Amber says designing for other clients is easier than designing for herself. 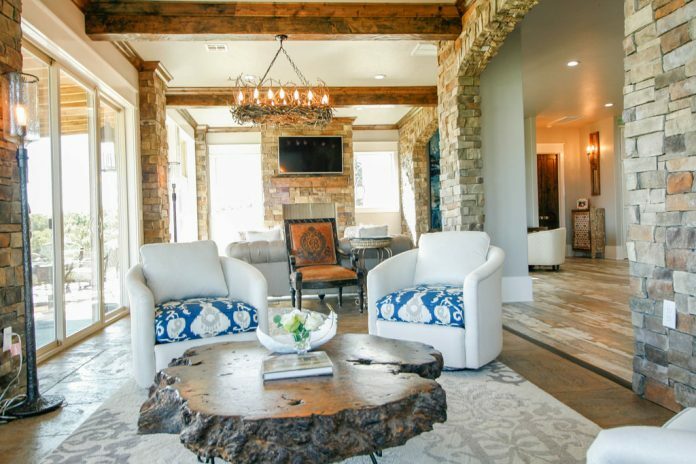 But with years of experience in her portfolio, she knew she and Jason wanted a home that would capture multiple views of the lake, provide a carefree environment and become a perfect place for entertaining family and friends. A spacious kitchen was a must. In this home with few walls, the kitchen is located near a spacious family room. 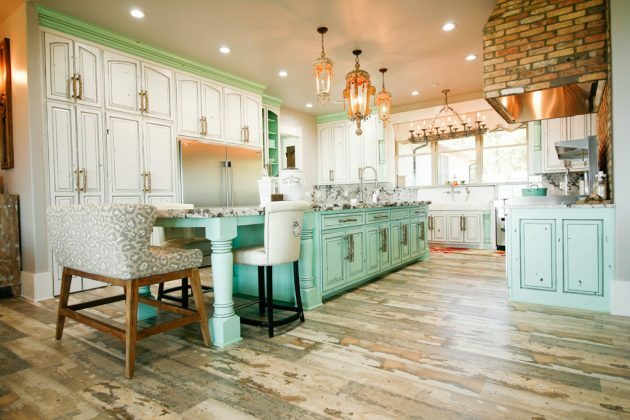 The kitchen has a large center island that becomes a dining table at one end. There’s also a hidden pantry, a beautiful hood over the restaurant-style oven, all stainless steel appliances and an old-fashioned farm sink. 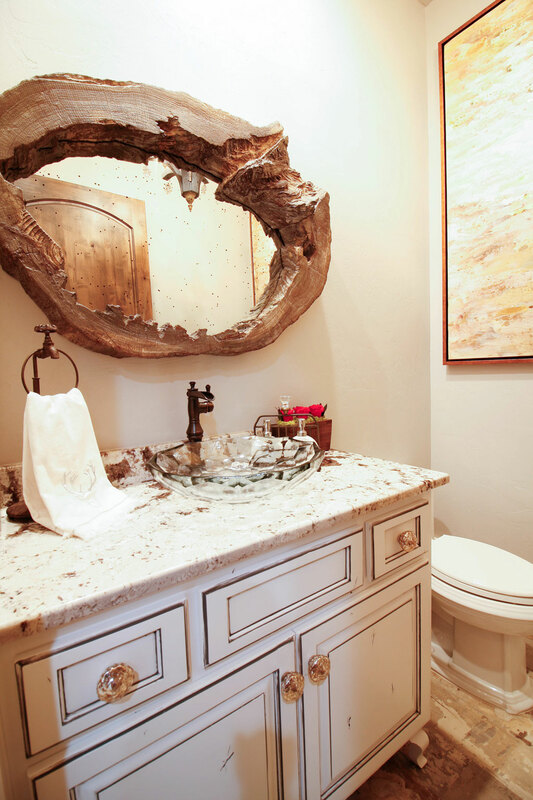 That sink was probably inspired by Amber’s childhood close to farms near Miami, Oklahoma, she says. The home uses natural materials for accessories throughout. Twigs are intertwined to form a rustic chandelier. A cozy seating area addS a comfortable conversation area to the master bedroom. Two fireplaces in the open areas – kitchen, living/family and dining rooms – add the right touch of warmth to this home. “There’s also lots of seating in the living area, which makes the design quaint but comfortable,” says Amber, who designed all of the furnishings in the home. Not surprisingly, Amber shopped at her own store, Nuance, for fabrics, lighting fixtures and accessories. The master bedroom offers multiple views of the lake and Amber designed this suite to enjoy those spectacular views. Reflecting on her design career, Amber says she especially enjoys the initial part of a project while listening to the clients’ needs and desires for a new look in a room or new home.